Celebrate Oktoberfest with beer braised brats with onions. The brats are marinated in a combination of onions, mustard, seasonings, and beer. You will want to use full flavored beer for this recipe. This could be an amber ale or lager. 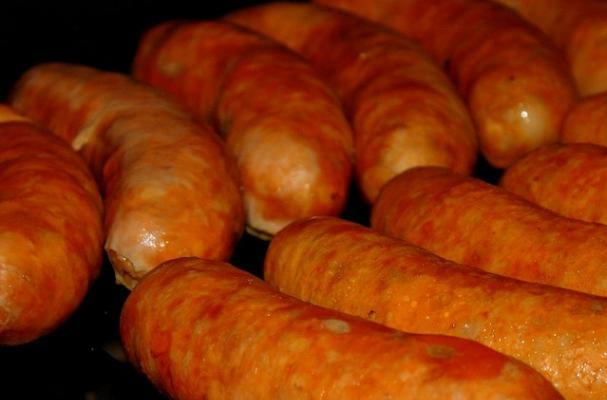 Place the sausages in a soft roll just before serving. Keep the brats simple with some mustard, grilled onions, and sauerkraut. Prepare Grill for medium indirect heat in two zones. Slice onions into disks and Drizzle with oil and salt and pepper. In the aluminum pan, combine beer, mustard, garlic powder, celery salt, caraway seeds, hot pepper flakes, and hot sauce. Place on indirect side of grill. Serve on the sub rolls with plenty of onions.